I’ve officially fallen off the Nablopomo wagon, but I will still attempt to post more frequently than I usually do. With Thanksgiving coming up, I doubt I would have been able to keep it up anyway. One of the parenting sites I follow posted this blog post on setting up your toddler’s environment in a Montessori way. I finished feeling guilty because we definitely restrict Monkey’s access to certain areas in our home. It made me wonder how many parents are actually doing things this way. The litter box is in there (far from our food prep area – it is next to our washer and dryer at the far end of the kitchen). The thought of him messing about with litter or worse just makes me queasy. Toddlers and litter boxes do not mix. And no, there is no other place in the house for it. Our 2 bathrooms are too tiny to hold one and when we did our remodel, we had a space fashioned specifically to hold the litter box. The oven is in there. One of my major Mama paranoias is scalding by pulling a pot of boiling liquid off the stove. Even though Monkey isn’t in there, I am in the habit already of pointing the handle to the inside of the stove. We also keep him out of our office, but we are readying that room to be Monkey’s room in the coming months, so that will soon be a non-issue. We used to close our bedroom door, too, but he can open it now, so that’s free territory. To put things into perspective so y’all don’t think Monkey is closed off in a single room, he has free reign of the living room, dining room, and entry (and now our bedroom and master bath). He also gets taken out to Monkey-specific activities (park, Gymboree, indoor playroom, swimming when the weather permits) twice a day, and naps for about 1.5-2 hours each day. So he isn’t really “stuck” in one spot for hours and hours. Still, this post got me thinking about ways in which I might make things more interesting and interactive. I’ve been feeling bad lately, too, that we have no space to do things like set up a water table or more sensory-type activity play areas. We have outgrown our condo, but aren’t going to be moving until DW can get back to working part-time (we’re thinking when Monkey starts pre-school next year). Well, sorry I missed yesterday, folks. Figured I’d jump back in today with a few cute things Monkey has done/said recently. The other morning, I woke up and Monkey was awake and whispering something. I watched and listened. He was pointing to me and whispering, “Mama.” Then he was pointing at DW and whispering, “Mommy.” Just about the cutest thing I’ve ever seen. Monkey loves bees (at least, pictures of bees). When he spots one, he joyfully calls out, “BEE!” The other night, he pointed to the ceiling in our bedroom in the night and yelled, “BEE!” The light coming through the blinds was casting a yellow and black striped pattern on the ceiling. Smart boy! I posted this elsewhere on the Internet today, but thought I’d put it here as well to get additional perspectives. Sorry for the length and depressing subject matter. My FiL died in January of 08 after a year and a half battle with leukemia. It was horrible and awful and my MiL was understandably deeply affected by the illness and loss. DW and I did all we could to help during this time. DW had a somewhat rocky relationship with both parents and shortly before FiL was diagnosed, she was planning to start scaling back her interactions with them. Not a CO or anything like that, but just not as involved. Then she was pulled in like WHOA. In March of 08, we decided to start trying for a baby. Our son was born in 12/09. Though of course this did not factor into our decision to have a child, we thought it might help MiL deal with her grief and give her something new and wonderful to focus on. She was thrilled about the coming grandbaby. In the years since FiL’s death, MiL has become more and more self-involved, selfish, and demanding/needy. In my opinion, she is showing hypochondriac symptoms. She has had an ailment and surgery pretty much every few months for the last couple of years for mystery type ailments like sleep apnea, back pain. Not that these can’t be real problems, but in her case, it’s like she needs to be the center of attention and has constant health issues. She expects DW to be on-call for her during these crises despite the fact that we live 45 minutes away, DW is a stay-at-home mom, I work full-time, and we have a 22 month old. Selfishly, I am seriously annoyed that not only have we had zero support from her in the baby department, but she is super demanding. Example: DW is driving 45 minutes each way in the morning to take MiL to a doctor’s appointment that is 15 minutes from her home. She can’t drive due to her most recent surgery, but seriously, she can’t take a cab or find a friend to shuttle her to her appointment? Instead DW has to take half a day, I have to lose half a day of work, etc., etc. She gets all bent out of shape when DW resists at all. Also, she doesn’t work, has very little money and we know when the time comes that her money runs out, it’ll be on us to support her. DW says she will not allow her to live with us and I hope she stays true to that as I’d hate it and I know it would make DW miserable, meaning our lives would be somewhat miserable. I’m so upset that there is all this crap to deal with when I just want to be focusing on my own family. I’m worried MiL is going to be a downer and drain us of money, time, etc. for the rest of her life. DW is an only child so there is no one else to call on for help. MiL also lost her brother to a heart attack about 2 years ago. It’s been a horrible few years for her, no doubt, and I want to help out where we can. Trouble is she just needs/expects way too much – it’s more than we can give. 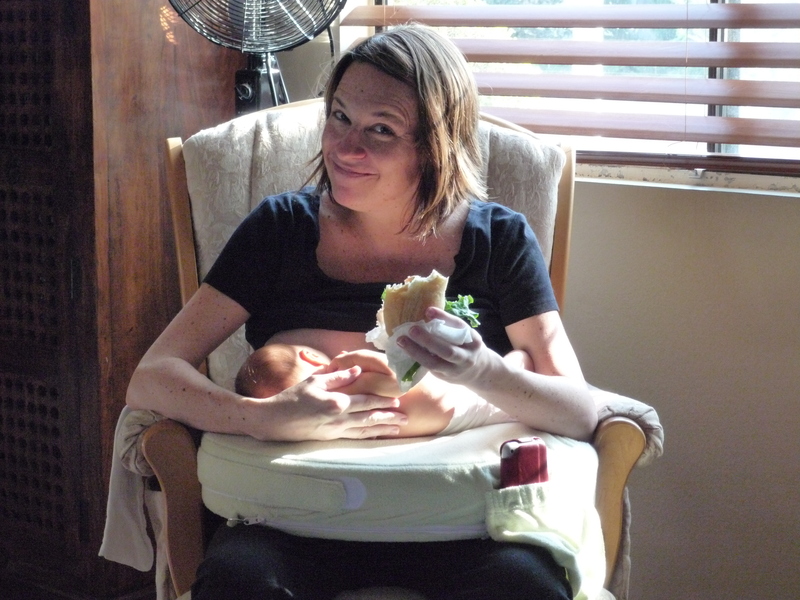 Shortly after I woke up in recovery after my c-section, DW arrived with the baby and the nurse asked if I planned to breastfeed. I told her I was and she handed him to me and said, “Okay, here you go.” I just looked at her like WTH do I do now? I did not remember a single thing I had learned in the class and was a total deer in the headlights. DW finally went home to shower and catch a short nap. Shortly after she left, the hospital photographer came by to take newborn pics! I knew DW would want to be there so I asked if they could hold off and was told they could for maybe an hour. I called DW and she rushed back to be there. My mom thought I was nuts to hold off for DW, but I knew she’d want to be part of it and guess what? SHE DID! I even brought it up recently and she said of course she wanted to be there. When it was time to leave the hospital, it took us FOREVER to get the baby strapped into his carseat. He was just so tiny and floppy and we had never put a newborn into a carseat before. A nurse was hovering and not really helping at all, which just made matters worse. In hindsight, I wish someone had told us to just bring the carseat into the hospital room and do it there. It would have been much less stressful and we’d have had less of an audience. The day we got home from the hospital, DW showed me an adorable vintage-style Christmas card that a friend sent to Monkey for his first Christmas. I got teary and went into our bedroom. I laid in the bed and just started crying. The sweetness of the card, the realization that I had a baby and this was his first Christmas, the pain of my incision, the newness of motherhood – it was so overwhelming. DW came in to check on me and saw that I was crying. I told her I was fine and just needed a little time on my own. She left, I had my cry, took a quick nap, and felt much better. My mom stayed with us for three weeks post-birth (my dad was here with her for the first week). I told her specifically when I was pumping in the bedroom not to come in. I was very self-conscious and didn’t want to share the experience. Well, she came busting in one day as I was pumping and I was very exasperated and told her to leave. She left and made a comment to DW about me “freaking out.” Whatevs, Mom, whatevs. When I was pumping to get my supply up during that first week or two, my mom would clean all of my pump parts and bottles and have them waiting for me before the next pumping session, including middle of the night ones. The first time we went to the lactation consultant (who was AWESOME), tiny Monkey freaked out like crazy. I tried and tried to get him to calm down but had no luck. The second time we visited the LC, I cried when she asked what DW could do to help me be successful with breastfeeding. Poor woman earned her money with us 🙂 To her credit, she said she knew it was a successful session if the mom shed tears. When Monkey was a newborn, he would choke in the night (the nurses said that happens frequently with c-section babies – they get amniotic fluid in their lungs or some such thing). It was horrific and scary. I remember being asleep in the hospital with DW asleep in the next bed and Monkey between us. He would start to choke but I couldn’t get to him because of my incision. DW was deeply asleep so I yelled, “DW! DW!” Poor woman would wake with a start and rush for the baby. That terrible choking went on for a week or two and I was afraid every night when we put him down that it would be his last. What an awful feeling that was. The doctors and nurses were all very nonchalant about it, which was also infuriating. My mom, DW, and I would take turns sitting with Monkey in the night when he would wake. We had a Boppy set up in the corner of the couch and one of us would sit with him and watch television. One night I noticed my mom seemed really tired, so I told her I’d watch if she wanted to go to sleep. She refused (she loves her Granny time) and I said, “Okay, but do not fall asleep. He can’t sleep in the Boppy without supervision.” She was like, “Mxxx, I will not go to sleep.” When I came out later to check on them, guess who was asleep? It’s kind of funny now, but I was so angry at the time. I’m sure there are more things I’m forgetting, but this gives a pretty good idea of how insane life is with a newborn I think. Just a quick update – Monkey seems to be fully recovered. However, he was up last night from 1:30AM-8AM. OMG! This boy! He sure knows how to pick these bad nights. I had to go into the office this morning. Argh! Short post today as poor Monkey is recovering from his first big stomach bug 😦 He was pretty sick yesterday, but slept decently and is mostly back to normal today. His fever seemed to really spike in the night, but he slept through it and is only slightly feverish today. He also would have slept until 6, but it was 5 thanks to stupid daylight savings. Here’s hoping tomorrow isn’t too terrible. We’ve been figuring out what to get Monkey for his birthday (12/21) and Christmas, so I thought I’d post our ideas and see what you all are planning to get. The toy store in our mall has one of these shopping carts and Monkey LOVES it. So we have that on the list and are planning an IKEA trip to buy “food” to put in it. Yeah, these are all rather high-ticket items, so we plan to get one for his birthday and one for Christmas and my parents will most likely pick up the third (I’m thinking they’ll get him the wagon). Then there are a few small items (Hot Wheels/Matchbox cars, which he LOVES, a couple of Green Toys trucks, some additions to his Thomas train set). If you’re interested in the any of the above pictured items, just click the picture and you’ll go to the site where it is the cheapest 🙂 DW did her homework. So what are your kids getting this holiday season?